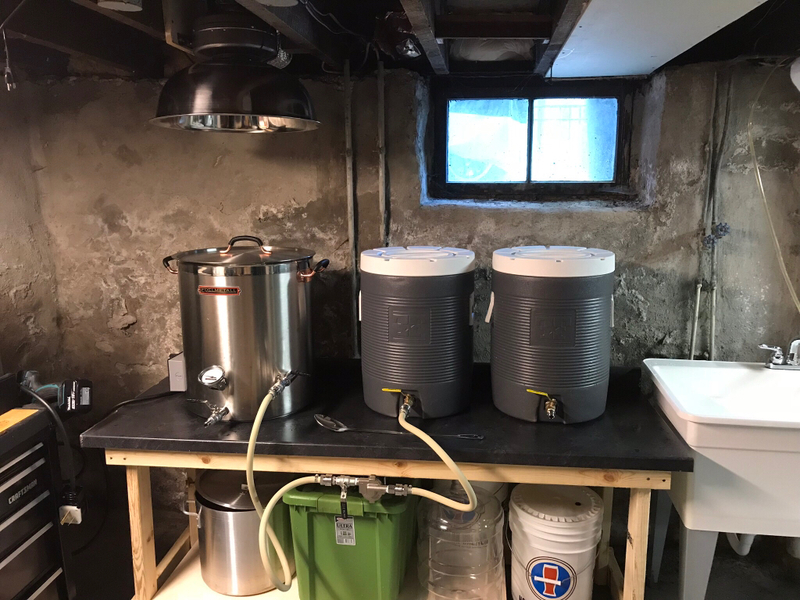 Here is my basement brew setup! I have a 20 gallon electric kettle for future larger batches with 10 gallon cooler MLT and 10 gallon HLT. 5500W element with manual on/off via twist-lock receptacle. 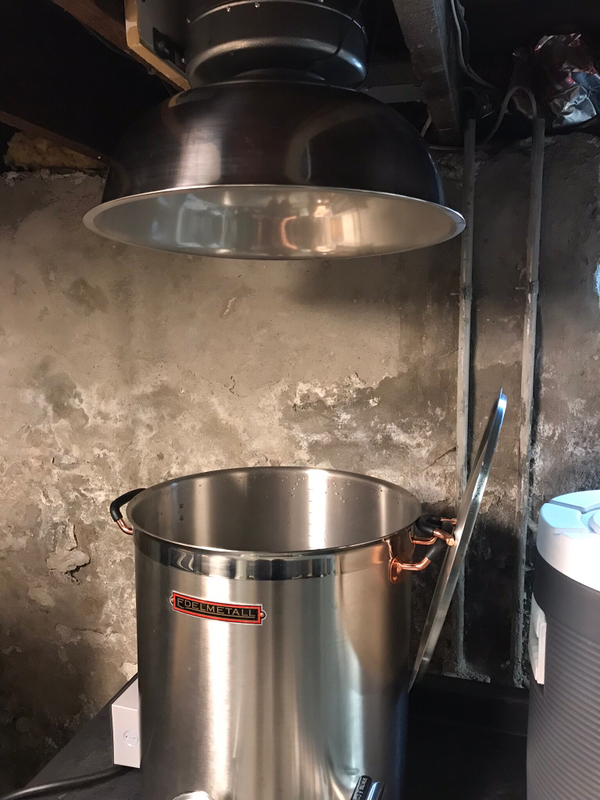 The kettle is ventilated with a 450cfm fan and 30 quart mixing bowl attached as a hood vented out through the old dryer vent escutcheon. Inspired from another setup I saw somewhere. Installed a new utility sink since the old one was really gross for sanitation reasons. Thanks. Forgot to mention the table cost about $75 to build. 66” laminate countertop and 2x4. Only 36” to surface makes for easy access for stirring and inspecting the vessels. Steel leveling feet for my ancient basement floor also keep the wood off which should help sanitation. Looks really great! I just bought a house and will again have a dedicated brewery. This gives me some ideas. I'm super jealous of the double wide utility sink. I'd love to have a nice way to set my fermenters/kettle up to dry inside, over a sink. Yep. It’s a 30qt mixing bowl with the bottom cut out to fit to an in-line fan set. Works reasonably well although the CFM is a little low. Need to step up to the next size. Doesn't that kettle warp the counter top when it gets rolling? I too am building a new home in the spring with a dedicated brewery space. I like your exhaust fan solution. its such a clean space! 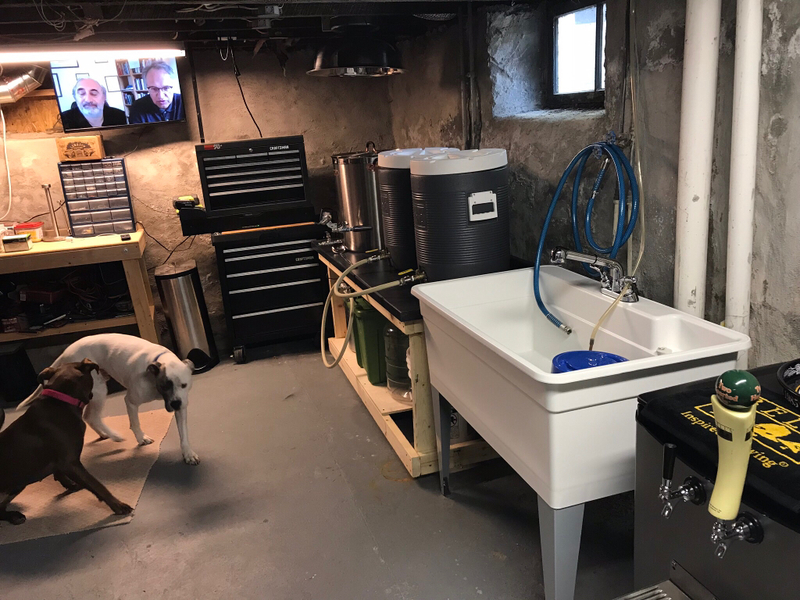 Do you use that util sink to clean buckets, carboys, kegs, etc? how does it work out? Plenty of room? I was thinking about getting one of those. No issues at all with the countertop. The interface with the Formica is theoretically 212F but it’s probably really only 200F. There is almost no noticeable heat below. I have a small sheet of 1/2" polyiso insulation between my boil kettle and the laminate countertop. Definitely no heat problems then. If I'm not mistaken, it takes much higher temps than 212F to warp the countertop, but I'm being extra cautious. I see no one mentioned the Gad Saad video in the background!